Rockford, MI: East Rockford Middle School 6th graders have been working with Trout Unlimited’s Rogue River Home Rivers Initiative (TU) and the Lower Grand River Organization of Watersheds (LGROW) to promote watershed health in Rockford with on-the-ground restoration practices and community education initiatives through the Great Lakes Restoration Initiative (GLRI). Students spent a recent afternoon stenciling educational messages on storm drains in downtown Rockford’s network of parking lots. The stencils, which read, “No Dumping, Drains to Waterway,” will serve as an important reminder to the community that everything that enters a storm drain ends up in a river, lake or stream untreated. Keeping litter and other pollutants out of storm drains is critical to protecting our coldwater resources. The Earth Keepers continued their efforts to revegetate downtown Rockford with native species and took on their third restoration project along the White Pine Trail, planting 2,000 native flowers, grasses and sedges this June. Since 2015, these Rogue River stewards have been converting lawn grass to native bioswales that help manage polluted stormwater runoff and support biodiversity. Their newest site was previously overrun with invasive Phragmites, an aggressive nonnative plant that out-competes and displaces native plants and animals. 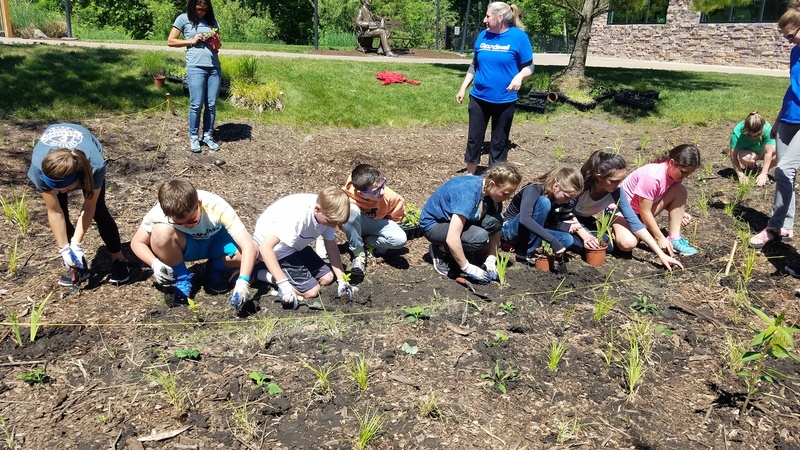 Over the past three years, the 6th graders have installed more than 8,000 square feet of deep-rooted native plants that will filter out pollutants, recharge groundwater, and regulate flows and rising temperatures in the coldwater trout stream. Lastly, TU worked with the West Michigan Environmental Action Council to put on a rain barrel workshop at Rockford Brewing Company and distributed 25 free rain barrels to community members. Rain barrels capture rainwater from roofs and save it for later use which saves water and lessens the volume of stormwater runoff traveling into our streams and rivers. The GLRI was launched in 2010 to accelerate efforts to protect and restore our Great Lakes, the largest system of fresh surface water in the world. TU, LGROW and partners were awarded funding to implement green infrastructure and other practices to reduce the impacts of stormwater runoff, including sedimentation and degraded habitat, within the urban areas of the Lower Grand River Watershed. Funding for the GLRI, which is administered through the EPA, would be zeroed out under the Trump administration’s recently released proposed FY2018 budget, eliminating important efforts such as this and many other projects on which TU is a partner. Altogether, the projects listed above will result in 9,200 sq. ft. of bioswales, a 500 square foot rain garden, and over 10,000 square feet of floodplain restoration and native habitat leading to a reduction of almost 1.5 million gallons of stormwater runoff entering our local waterways. The total project cost is $451,600 with the EPA providing $340,065 of that funding and the remaining $111,535 being contributed by in-kind services from TU, LGROW, and its partners. This project is a prime example of the success of the many collaborative, regional partnerships in which TU participates. The Rogue River Home Rivers Initiative Project is funded by the Frey Foundation, the Grand Rapids Community Foundation, the Wege Foundation, the Wolverine World Wide Foundation, and the Schrems West Michigan Trout Unlimited. Jamie Vaughan is Trout Unlimited's Rogue River Home Rivers Initiative coordinator.